I care for no one but myself and nothing but my belly!" Twelve-year-old Will Sparrow travels light, as befits a runaway, and his philosophy lies even lighter upon his conscience. Abandoned by his mother and sold to a cruel tavern keeper for all the ale he can drink by his drunkard father, Will swipes one too many meat pies from the kitchen and faces a short-lived future as a chimney-sweeper's boy, and he is only saved from that fate by the quickness of his heels. 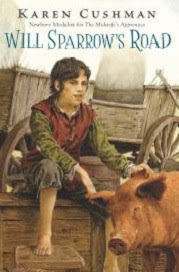 Will hits the road with nothing but a horse blanket stolen from his master's barn and a bag of apples pillaged from an orchard and whatever provender he can find to fill his belly along the way. And on that road to he knows not where, Will encounters other wanderers--Nell Liftpurse, who steals his boots, his blanket, and his apples to boot, a larcenous tooth-puller who offers him a meal in trade for pretending to have a tooth pulled painlessly, a conjurer with lying legerdemain, and a kindly stout man with a trained pig named Duchess, who feeds him and takes him along to a fair. For a self-proclaimed liar and thief, Will finds a town the most likely place to provide provender, and as the spires of a promising minster rise in the distance, he finds the road becoming crowded with beggars, pilgrims, peddlers, and wanderers like himself. "What town be this?" Will asked a metalsmith with cooking pots and warming pans tied to his donkey. "It be Peterborough. Or Scarborough" the metalsmith answered. "Or mayhap Foxborough or Dogbourough. 'Tis some borough, I believe." "Tis a fine fair, I hear. Three days long. Goods aplenty to buy for those with coins, and smells to smell for those without." Hoping to pinch a loaf from a busy baker or cadge a copper from someone needing an extra hand setting up a booth, Will eagerly enters the town and indeed does find employment with a seemingly kind presenter of "curiosities and wonders" who promises him tuppence a day and dinner for his work as wagon driver and shill for his show. Will finds himself among assorted oddities claimed to be a one-eyed pig, a unicorn's skull, and a sea monster skeleton, and a baby mermaid in a flask. But chief among the exhibits are a bad-tempered dwarf named FitzGeoffory, and the fur-faced cat-girl who calls herself Grace Wyse. At first Will thinks his new master a fair man and his living prodigies freakish and frightening. But as he works with them, and they move on to Ely Fair, Will learns a new lesson, that things are not always what they seem, and when Tidball tries to sell Grace to innkeeper, beating poor Fitz mercilously when he defends the child, Will has to come to their aid. He shoves Tidball down, his head hitting rock, and Will fears that he will be hanged by the sheriff for murder. But as Will hits the road alone again, he begins to think. Would the law take Fitz and Grace and punish them? Fitz and Grace were oddities, easy to accuse. Will's face flushed with shame. He had left them to take the blame. But he cared for no one but himself, did he not? Faced with a choice between human ties and self-protection, Will Sparrow takes a new road in Karen Cushman's forthcoming Will Sparrow's Road (Houghton Mifflin Clarion, 2012). Cushman, a two-time Newbery winner for her outstanding historical fiction (CATHERINE, CALLED BIRDY and The Midwife's Apprentice) breaks some new ground with her first boy protagonist, moving from medieval to Elizabethan England, to tell of the nonstop adventures of Will Sparrow, whose fleet feet and quick wits belie the good heart which lead him finally to the home and family he longs for. A coming-of-age story set in a very different time from our own, this tale of Cushman's makes this world come alive for middle readers. An appended Author's Note provides a history of fairs from prehistory through the twentieth century, where the sideshow of freaks and wonders persisted until recently in our own regional state and county fairs and carnivals. Cushman also provides a extensive bibliography of related titles for middle readers. What a nice, thoughtful review. Thank you.